Mick Bohan’s side reclaimed top spot in the table by virtue of their superior points’ difference. Nicole Owens scored two points on Sunday. 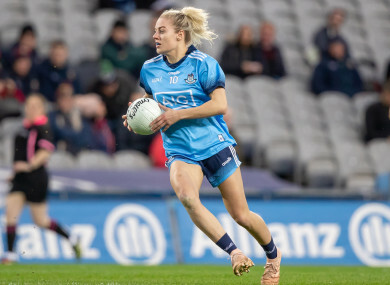 THE ONLY UNBEATEN record in the Lidl NFL Division 1 was ended in Moycullen as goals from Sinead Aherne and Siobhan Woods gave Dublin the points against Connacht champions Galway. Tim Rabbitte’s Galway were already sure of their spot in the semi-finals ahead of this game, but they have now been joined there by Donegal, Cork and Dublin, who ground out the win in west Galway. Dublin got off to a great start when Aherne palmed to the net after eight minutes, but Galway replied through Barbara Hannon to only trail by one at half-time. But with Aherne and Nicole Owens in point scoring form, the closest Galway could get was one point as Mick Bohan’s side finished strongly to claim the honours. Dublin were first out of the blocks when Aherne goaled, but Galway responded immediately with an Olivia Divilly point. In a low scoring first-half, it was Dublin who looked the more clinical in front of goal. Firstly, a long-range effort from wing back Aoife Kane put them back into a three-point lead, which was quickly followed up by a well taken point by midfielder Jennifer Dunne. The Galway ladies were spurred on by a large home crowd and Hannon’s smart finish cut the gap to a point. Almost straight from the kick-out Divilly drove at the Dublin defence and set-up Roisin Leonard who tapped it over from close range to level the game on 26 minutes. The final score of the half came by way of a super Nicole Owens point but Dublin were certainly the happier side at the interval as they led 1-3 to 1-2. Aherne and Tracey Leonard exchanged frees to start the second half, but the move of the game resulted in Woods’s goal after 38 minutes, which proved decisive. Galway continued to battle hard and Roisin Leonard reduced the gap back to three points with 15 minutes remaining. But that was as good as it got for Galway as Aherne and Owens pointed Dublin towards the win as they reclaimed top spot in the table by virtue of their superior points’ difference. Scorers for Dublin: S Aherne 1-3, S Woods 1-0, N Owens 0-2, A Kane 0-1, J Dunne 0-1, L Davey 0-1. Scorers for Galway: B Hannon 1-0, R Leonard 0-2, T Leonard 0-2, M Glynn 0-1, S Conneally 0-1, O Divilly 0-1. Substitutes: L Davey for McEvoy (h-t), S Woods for Nolan (h-t), N Hetherton for Dunne (45), S Killeen for Owens 50, H O’Neill for Magee 60. Substitutes: M Seoighe for Hannon (21), S Conneally for Coen (34), S Molloy for Burke (38), M Coyne for Cooney (48), R Ni Flaharta for Gannon (55), L Noone for Divilly (60). Email “Goals from Aherne and Woods help impressive Dublin end Galway's unbeaten record”. Feedback on “Goals from Aherne and Woods help impressive Dublin end Galway's unbeaten record”.